Total Reclaim is the leading recycler of hard to handle materials in the Pacific Northwest. No matter how big the recycling challenge, it’s handled. Reusing surplus computers and electronics is good for the environment and can earn extra income for your company. Before this can occur, computers and other devices that contain sensitive data must be handled properly to protect your information. Total Reclaim offers professional data destruction, including shredding and wiping services for all memory containing devices. Further, we have partnered with Tech Reuse to maximize the financial returns to us and our clients from the re-marketing of their old equipment. We utilize proprietary tools to wipe hard drive, record serial numbers and create auditable certificates of destruction. 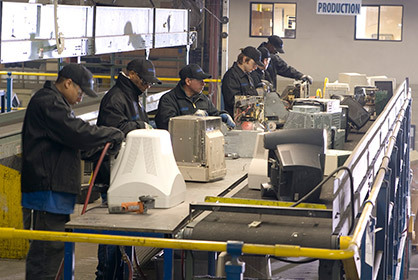 Total Reclaim operates the largest electronics shredder in the Pacific Northwest, capable of destroying any size or quantity of hard drives and any data bearing device including flash drives, CD-ROMs, floppy disks, copiers and tape drives. We offer outright purchases of equipment, consignment sales and commodities brokering. Computers are professionally tested and refurbished by Tech Reuse trained staff. A detailed reuse report is provided that describes the condition and specifications of each asset, serial numbers and the recommended disposition. Additionally, we offer clients the choice of donating their surplus to charities, communities, or special projects. All equipment that no longer has useful life is responsibly recycled. CONTACT US FOR A QUOTE AND A SAMPLE REUSE REPORT. successful backhaul programs throughout Alaska. The Alaska branch is interested in hearing from folks living and working in rural Alaska. Let us know what we can do or what information we can provide that will help you address your solid waste and recycling needs. Recycle anything with a battery or a cord. Certify destruction of hard drives containing sensitive business or personal information. Come to your facility and pick up your e-waste, whether by the cartload or the truckload. Recycle all material in a way that is responsible to the environment as well as your reputation. EcoLights Recycling Kits—safe, convenient, pre-paid boxes for your old fluorescent lamps, CFLs and other devices. Just fill the box and ship them to EcoLights for recycling. Fiber Drums and other storage containers—we deliver to your site, you fill them up, we take them away. Drop-off—feel free to bring your used fluorescent lights to any of our facilities or one of our collection partners. Whole Fixture Recycling—save even more time and money on your projectby simply recycling the entire light fixture instead of just the lamp. For more information about how to easily and conveniently recycle your fluorescent lamps, visit the EcoLights site. 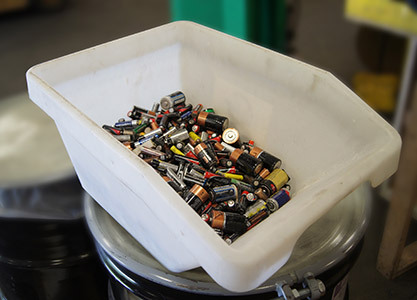 Assess your recycling requirements based on the types and quantities of batteries at your site. Establish a collection and recycling program. Educate staff on safe packaging and disposal while providing guidelines to ensure that battery shipments are delivered safely. Drop off your appliance or arrange for pick-up with Total Reclaim. We break down the appliances at our Seattle recycling facility, eliminating waste that would otherwise enter landfills. The materials are separated and shipped off for further refinement, ultimately becoming feedstock in the manufacturing of new products. Dedicated recovery support vehicles provide on-site refrigerant recovery to meet any project schedule. Quick dispatch and job-site recovery to meet your critical situations. 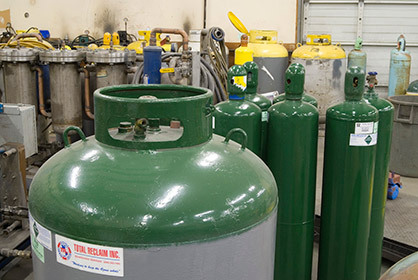 Purchase of used refrigerants and sale of reclaimed refrigerant gases at competitive prices. Annual customer reporting and documented environmental compliance. Our personal approach and technical expertise has made us the choice of business customers throughout the Northwest. Copyright 2019 Total Reclaim. All Rights Reserved.